How many bikes do you own and what’s your favourite place to ride? I have recently sold my own personal bikes due to a shortage of space – and because I now have a fleet of 23 demo bikes to choose from! But I have kept my Raleigh Chopper mk1 and ‘80s Haro minilite BMX, both awaiting restoration. If you asked me last year I’d have said my favourite place to ride was undiscovered woodland, but now it would have to be on the trails/cycle paths my family can participate on as I’ve reintroduced cycling to my wife. She has really taken to the e-bikes and my daughter also loves them. My eldest son cannot get enough of the surge on take-off, plus the ability to climb steep banks and rutted pathways. I have a baby seat on the mine, so we do look a sight arriving at a ride with four e-bikes ranging from a step-through city commuter, two MTBs and one hybrid. We immigrated to the UK five years ago and in South Africa I had my own business in the automotive field. Once here I had a period of consolidation working for a well-known satellite firm but moved on to Maxtrack, an extreme sports distribution company responsible for distribution of the BH Emotion electric bicycles in the UK. My passions include cycling, ‘70s and ‘80s cars, motorbikes and bicycles, but first and foremost is enjoying my fantastic family, watching them grow and develop. What’s your role at BH? 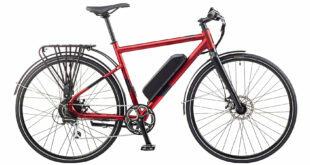 Sales manager responsible for the appointing, support and development of dealers for the BH Emotion electric bikes in the UK including brand building. To be honest with you the bikes sell themselves, so my main function is to provide a fantastic aftersales service to our dealer network and promoting the brand, directing customers to our dealers. What can we expect from the new BH ranges? The 2013 range launched at Eurobike and elevates the brand as one the leading manufacturers of e-bikes. Our existing dealer network will have a fantastic range to grow this part of their businesses, so an exciting 2013 lies ahead. We will be at most if not all of the shows remaining this year in the UK. How should bike dealers get in touch? Prospective dealers can get in touch with Maxtrack HQ distribution and warehousing at New Rock, Kemply Road, Dymock, GL18 2BB. Dealers can call 01531890955 or 07804 413083, or email info@maxtrack.com or rob@bh-emotion.co.uk.